Was Kenny Wregget the one who got away? A Flyers fan I work with and I were recently discussing an all-Flyers team of current NHLers who won a Stanley Cup (not as Flyers, obviously– everyone from that era is of course already dead). (I’m sort of joking.) Recently-crowned Blackhawk backup (and possible future Flyer) Ray Emery was his obvious choice as starting goalie, but he couldn’t think of a single backup goalie. I guessed–correctly–that was because there wasn’t one, and hasn’t been one since Ken Wregget won a Cup with Pittsburgh in 1992. Few goaltenders win Stanley Cups, because few teams win Stanley Cups. This is historically rare. I still remember reading a 1989-90 season preview picking the Flames to repeat because “no one wins this thing just once.” Before the Flames won the 1989 Stanley Cup, the NHL had played 21 seasons since expanding from the Original Six to twelve teams, including the Flyers, in 1967-68, and eventually to 21 total teams by the late 1970s. During those 21 seasons, a total of just five different teams (Montreal, Boston, Edmonton, the Islanders, and the Flyers) won the Cup. Even counting season-to-season movement in starting goalies as well as counting backup goalies, a realistic denominator for those 21 seasons would be much lower than 42. We’re counting current NHLers here, so the historic trends don’t apply per se, but we’re still talking low numbers: 30 total teams, 16 total playoff teams, a maximum of two goalies per year who end up with a Cup and a ring. 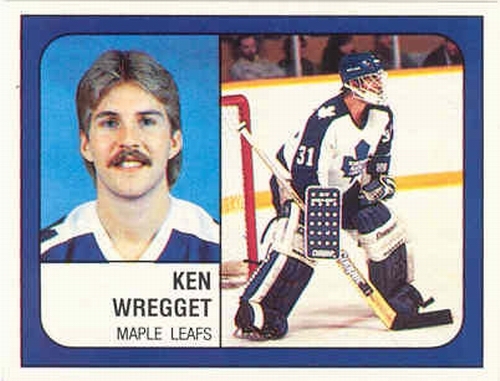 In short, it would seem to be no embarrassment to the Flyers that, if Emery doesn’t count, the only goalie in Flyers history to win a Cup post-Flyers career was Ken Wregget, who played a total of 40 playoff minutes (0-0, .750 SV%, 6.00 GAA). The only other Flyers who have ever won Cups, period: Bernie Parent of course (1974 and 1975 Flyers), Wayne Stephenson (1975 Flyers), one-time Hextall mentor Chico Resch (1980 Islanders), and the late Michel (Bunny) Larocque (1979 Canadiens), whose 1983 Flyers career was only 80 minutes longer than Ken Wregget’s 1992 playoffs. Won a Cup before: Charlie Hodge, who won a Cup with the 1965 Canadiens as half of a goaltending tandem with Gump Worsley, was the only Seals goalie (1968-70) ever to win a Cup in the franchise’s 11 seasons before merging with the North Stars in 1978. Won a Cup during: Ed Belfour (but not Roman Turek, who saw no playoff time) won a Cup in 1999. Won a Cup before: Where to begin? Jacques Plante (1953, 1956, 1957, 1958, 1959, 1960 Canadiens), Glenn Hall (1961 Blackhawks), Eddie Johnston (1970, 1972 Bruins), Grant Fuhr (1984, 1985, 1987, 1988 Oilers), Tom Barrasso (1991, 1992 Penguins), Chris Osgood (1997, 1998 Red Wings), Manny Legace (2002 Red Wings), Bunny Larocque again (1979 Canadiens). Ottawa, Vancouver, and the Flyers have the metaphorical reputations, but St. Louis is quite literally a goalie graveyard. Won a Cup during: The Blues have never won a Stanley Cup. Won a Cup during: Jonathan Quick (but not Jonathan Bernier, who saw no playoff time) won a Cup in 2012. Won a Cup before: none. Bobby Taylor played two games with the 1976 Pens two seasons after backing up Bernie Parent in the Flyers’ first Cup run; however, Taylor had no playoff time with the Flyers and didn’t technically win a Cup. Won a Cup during: Tom Barrasso, Marc-Andre Fleury, Frank Pietrangelo, Mathieu Garon, and of course Ken Wregget all won Cups with the Penguins. As a Canucks fan, I’m obligated to extend the time frame to 1970 to include the Canucks and Buffalo Sabres, two franchises who have also never won Cups. Won a Cup before: Grant Fuhr (1984, 1985, 1987, 1988 Oilers). Also, Roger Crozier (202 games as a Buffalo goalie from 1971-1976) won the 1966 Conn Smythe Trophy despite the fact his Red Wings lost the Cup to Montreal, 4-2. So Ray Emery won’t be cursed one way or another whether he does or doesn’t wear the orange and black again, nor would he curse the Flyers. However, if he does win a Cup with the Flyers, he should end his career with the Blues, where old goalies go to die. This entry was posted on June 30, 2013 at 10:49 pm and is filed under Flyers-related with tags Andy Moog, Barons, Blues, Canucks, flyers, Grant Fuhr, Hasek, Jacques Plante, Ken Wregget, Kings, North Stars, Penguins, Ray Emery, Roger Crozier, Sabres, Seals, Stars, Tom Barrasso. You can follow any responses to this entry through the RSS 2.0 feed. You can leave a response, or trackback from your own site.